For all the bombast, coercion, venom, and widespread ridicule marshalled by the left3 and directed against Americans who have steadfastly remained unmoved in their conviction that homosexuality and transgenderism are immoral behaviors, it is refreshing and encouraging to hear the truth declared by credible scientists. 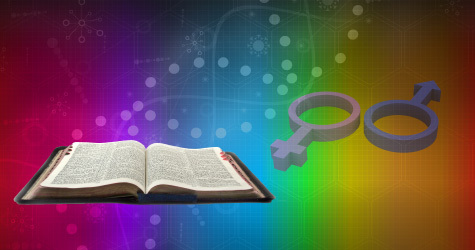 In a special report titled “Sexuality and Gender: Findings from the Biological, Psychological, and Social Sciences,” Lawrence S. Mayer and Paul R. McHugh divulged their startling findings.4 Consider their qualifications and credentials. You see, if the Bible is, in fact, of divine origin, i.e., if there really is a God, and He’s the God of the Bible,13 then the information given in the Bible can be counted on for its veracity. If it affirms explicitly that homosexuality is “against nature” and an “abomination” (Romans 1:26; Leviticus 18:22),14 then we can know that such a behavior is not genetic.15 Knowledge of the truth regarding human behavioral proclivities pertaining to a host of actions is available from the Creator who created the human body and infused it with a spirit, a personality, a mind. We can know what is right and what is wrong, what is moral and what is immoral. 1 Vice-President Joe Biden ludicrously labeled transgender discrimination “the civil rights issue of our time”—Jennifer Bendery (2012), “Joe Biden: Transgender Discrimination Is ‘The Civil Rights Issue Of Our Time’,” The Huffington Post, October 30, http://www.huffingtonpost.com/2012/10/30/joe-biden-transgender-rights_n_2047275.html. 2 William Allen (1965), The Nazi Seizure of Power (New York: Franklin Watts); George Mosse (1981), Nazi Culture (New York: Schocken Books), pp. 7ff. ; J.P. Stern (1975), Hitler: The Führer and the People (Berkeley, CA: University of California Press), pp. 35ff. ; Jacques Ellul (1965), Propaganda: The Formation of Men’s Attitudes (New York: Vintage Books). 3 By “the left” I mean those who champion behaviors that throughout history have been deemed immoral by Christian standards. Sometimes alluded to as the “cultural aristocracy,” the primary instigators in America have been television networks and the leftist news media, university faculties, liberal mainline Protestant denominations, Hollywood, liberal judges, and various foundations that are dedicated to transforming the American way of life. 4 Lawrence S. Mayer and Paul R. McHugh (2016), “Sexuality and Gender: Findings from the Biological, Psychological, and Social Sciences,” The New Atlantis, 50:10-143, Fall, http://www.thenewatlantis.com/publications/number-50-fall-2016. The authors explain their methodology: “This report offers a careful summary and an up-to-date explanation of many of the most rigorous findings produced by the biological, psychological, and social sciences related to sexual orientation and gender identity. We examine a vast body of scientific literature from several disciplines. We try to acknowledge the limitations of the research and to avoid premature conclusions that would result in over-interpretation of scientific findings…. [O]ur focus is on the scientific evidence—what it shows and what it does not show” (p. 10, emp. in orig.). 5 The reasons for recounting the lengthy and impressive credentials of the authors is to demonstrate (1) that they would be considered by the secular community to be highly qualified to discuss the subject, and (2) that they are not “right wing radical” Christians or religious fanatics who are biased in their appraisals of the scientific evidence. Indeed, Dr. McHugh describes himself as a “politically liberal” Democrat—Erica Goode (2002), “Psychiatrist Says He Was Surprised by Furor Over His Role on Abuse Panel,” The New York Times, August 5, http://www.nytimes.com/2002/08/05/us/psychiatrist-says-he-was-surprised-by-furor-over-his-role-on-abuse-panel.html?pagewanted=all. 6 Mayer and McHugh, p. 6. 9 p. 8, emp. added. The authors note: “The prevailing explanation in the scientific literature is the social stress model, which posits that social stressors—such as stigmatization and discrimination—faced by members of these subpopulations account for the disparity in mental health outcomes. Studies show that while social stressors do contribute to the increased risk of poor mental health outcomes for these populations, they likely do not account for the entire disparity” (p. 59, emp. added). 11 Ibid., p. 9, emp. added. 12 Ibid., p. 6, emp. added. 13 Abundant evidence proves these facts. See apologeticspress.org. 14 For further discussion regarding the biblical view of homosexuality, see Dave Miller (2012), “The President and Homosexuality,” Apologetics Press, http://apologeticspress.org/APContent.aspx?category=7&article=689&topic=36. 15 Four reasons why we can logically know that homosexuality is not genetically based: (1) The God of the Bible would not forbid or condemn a behavior, holding an individual culpable, if the behavior is in-born, endemic to a person’s being, or an act that the person cannot control or from which he cannot refrain; (2) In referring to homosexuals, when Paul said to the Corinthians, “such were some of you” (1 Corinthians 6:11), he demonstrated that practicing homosexuals can cease their illicit practice; (3) As a matter of fact, many practicing homosexuals have reformed, further proving that the practice is a choice; and (4) no scientific evidence exists demonstrating the presence of an alleged “gay” gene. 16 Mayer and McHugh, p. 6.